What is the volume of plasma in a healthy person? How does the blood plasma volume calculator work? 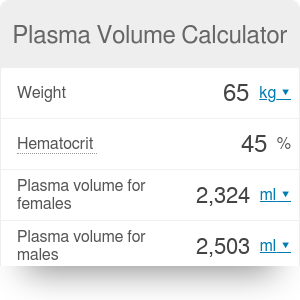 The plasma volume calculator finds the blood plasma volume using the patient's hematocrit (Hct) and weight. If you're curious what is the volume of plasma or how it's estimated, read on! Please note that this is a calculator of blood plasma for adults. It doesn't estimate plasma volume for children. Plasma is a liquid that makes up around 55% of blood volume. In the preparation process of donated blood or in a laboratory blood test called hematocrit, it's separated by centrifugation from the formed elements of blood. They constitute the other 45%, most of which are red blood cells. carbon dioxide (plasma is the main medium of transportation of excretory products) and oxygen. The plasma volume calculation is usually performed on the assumption that the patient's total blood volume (TBV) is 70 mL per kg body weight for males and 65 mL per kg body weight for females. In our blood volume calculator, we use far more complicated methods of estimating TBV. You can calculate blood plasma volume more accurately using these methods in advanced mode. Plasma Volume Calculator can be embedded on your website to enrich the content you wrote and make it easier for your visitors to understand your message.